One thing I pride myself with here at Let’s Start Investing is my ability to provide you detailed reviews from the inside. You will never see me review something that I don’t personally use or have experience using. This Motley Fool Stock Advisor Review is no different. I was a member of Stock Advisor from September 2016 – September 2018 and then again recently. I took a break because I am a member of the Armed Service and was gone for a couple months when my subscription expired so I had to re-subscribe once I returned and settled back into being home. The opinions found in this article are my own and hope you can benefit from them. This review will cover what Motley Fool Stock Advisor is, what it promises, how it stacks up to its claims, and whether I recommend it for others. Best of all, like my other reviews, I’ll take you inside my personal account so you can see exactly what it’s like to be a member so you can decide for yourself if this is the right investment service for you! What is Motley Fool Stock Advisor? Motley Fool is a company founded by brothers Tom and David Gardner in 1993. They have been trading stocks and teaching the fundamentals of investing for 26 years now and have amassed a great deal of success along the way. They pride themselves on their competitiveness with the S&P 500 and their ability to find timely stock picks. Here’s a graph of their success against the S&P over the years! So this sounds pretty good, right? Well, the numbers don’t lie and one thing that I do like about this service is that it shows you the picks it has chosen since it’s inception in 2002. I took this screenshot from the earliest recorded picks back in 2002. You’ll notice the line-outs indicate that they are no longer recommended and have had their recommendation closed, locking in earnings. You will also notice that no stock service is perfect! Electronic Arts closed with a loss of just about half of the investment. Any service that promises guaranteed results should probably be scrutinized carefully. Like any investment there is risk. The key is to stay diverse in your holdings. If you owned $10,000 in Electronic Arts and that was all you owned, you were probably pretty upset. If you spread that $10,000 evenly between those 9 stocks, you were probably pretty excited! 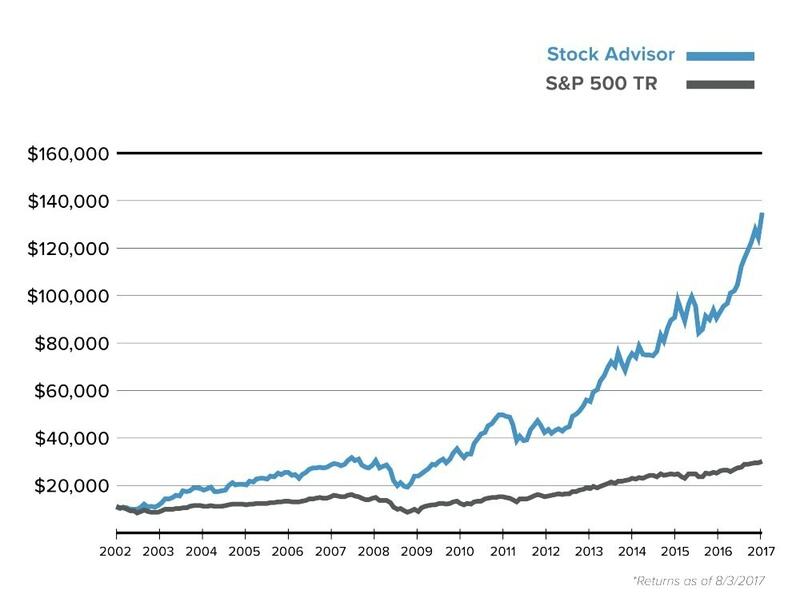 In fact, since this service has been around, David and Tom Gardner have been outperforming the S&P 500 by an incredible amount! That’s more than quadruple the growth of investing in an index fund. So that gives you an idea of how they have performed against the market but just because they have outperformed in the past, does that guarantee this type of performance in the future? Of course not. No one can guarantee results. All that is promised is sound logical analysis of each of their stock picks which gives you the chance to make an informed decision. What Does Stock Advisor Get You? The 10 Best Buys picked by Tom and David which are analyzed and seen as the perfect time to act. 10 Starter Stocks that should be in anyone’s portfolio that are proven winners. These are good for new investors and experienced investors alike. Access to a full library of investing material and resources to ensure you never feel lost! What’s in Each Stock Recommendation? The Buy Case – Detailed analysis on why that stock pick is picked and why it’s poised to be a winner. 24/7 Monitoring – Rest assured knowing analysts are constantly tracking each stock pick and alerting subscribers to when the stock should be sold in real time. Curious about the stock pick schedule? It’s really quite easy. Thursday is your new friend! What do I mean by that? So there you go! Every month, you’ll have an up to date selection of 12 stocks in total. Combine those with the starter stocks, and you will have a strong stock portfolio that’s diverse and balanced. What’s in a Buy Recommendation? The first thing you’ll see is a written out article analysis on why that stock has been chosen. You will also be told what makes it a good buy and what to watch for as far as warning signs to get out of the trade. The recommendation comes with risk analysis as well so you know if it’s something you want in your portfolio. When you go to the full article, there’s a small section on the right that’s called the “In a Minute” section which gives you the quick and dirty for that stock in case you don’t want to read the detailed analysis. This section is perfect for those that just want fast facts and the bullets on what makes this company stand out. So what makes this so valuable? Well, simply put, it takes all of the hard work out of choosing stocks for ourselves. Most of us have busy lives and to scour financial reports to find the best valued stocks takes a lot of dedication and discipline. Taking advantage of the expertise of David and Tom Gardner, means you get the benefit of all that research without lifting a finger! What makes Stock Advisor so great is that it is designed with the Individual Investor in mind. Motley Fool is about educating the average person and making investing possible and at the same time educational and fun. There are a couple other sections on the website that I want to touch upon. Firstly, I’d like to talk about the Performance Tab. Under the performance tab, you will see how every stock pick has performed since the inception of Stock Advisor back in 2002. Whether the stock pick was a winner or a loser, all the information is there so you can analyze the results for yourself. This is huge and shows how transparent the service is. Another thing I wanted to share is the Research tab. Under the research tab, you’ll find premium reports that are full of information about new trends to keep an eye on as well as who is leading the charge in these industries. By reading these, you will see which stocks to keep an eye on for the upcoming next big trend. Final Verdict – Not a Scam! Well, hopefully by now, you’ll see that this is definitely not a scam. 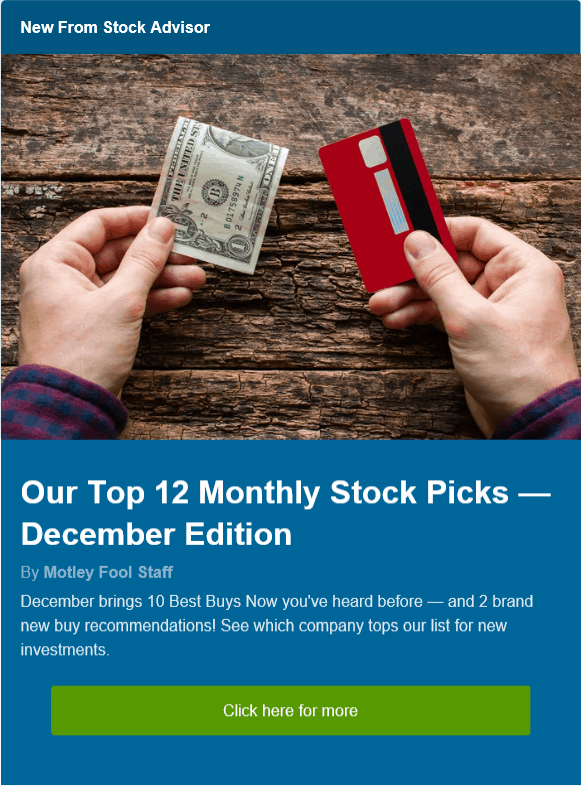 In fact with a huge community following, Motley Fool is one of the most successful investing education platforms available. In fact, they even offer a 30-Day Money Back Guarantee on their service if you are interested in joining the community. And with a promotional introductory offer of $19 for the first month, there’s no better time to see it for yourself. I’ve also been a member of Stock Advisor for over two years now. They continue to show value and keep me up to date on the latest ideas and trends. In fact, one thing that I didn’t mention earlier was their 10% Promise. Any time a stock pick of theirs jumps up or down more than 10% they right a detailed analysis on what caused that jump and what their current recommendation is as a result of the jump. That’s a huge benefit to the investor that sees a change and doesn’t know what to do next! So, Is This Program For You? Well that all depends on the type of investor you are. Hopefully you have an idea of what kind of investing style you want to pursue. If you don’t; however, this is an outstanding place to start. It uses a proven model of long-term based investing that doesn’t pay any attention to daily swings in stock price or short term up and down swings. This is perfect for the investor that wants to “Set it and Forget it” so to speak. Stock Advisor recommends investing with at least a 3-5 year time frame in mind. That means, you let the stocks go to work for you for this time frame and trust in the value analysis provided by Stock Advisor. For someone that doesn’t want to micro-manage their investments, this is a perfect service. However, if you are afraid of leaving your money unattended for this amount of time, long term investing may not be for you. If you need this to turn a quick profit, you’re probably in the wrong place. Can you make a large return in a short period? Absolutely! Does that mean, I should always expect these types of returns? Probably Not! The fact is my Apple shares have earned me over 45% from my initial investment a couple years ago but there were some ups and downs. The stock market moves around quite a bit. This is a term known as volatility. I’ve had a lot of success with Motley Fool but that’s because I’m investing for the long term and this style works for me. So who is this service not for? If you want to trade stocks by staring at candle stick graphs and reading charts every day, this is probably not for you. You are probably more interested in Day Trading which is a very risky type of trading that few have mastered. If you can’t let your money out of your site for more than a few days, this is probably not for you. If you are nervous about your investment and have to watch it every day, you will likely make a mistake one day and make a sale or purchase out of fear which will lead to you losing money. It’s not your fault. That’s human nature. Investing in stocks requires discipline and most simply don’t have that. Well, if you’ve read this far, I’d like to extend a heartfelt thank you! I’m very humbled and flattered that you gave me this much of your attention. I know you’re busy. We all are. I wanted to write you this Motley Fool Stock Advisor Review because I genuinely want people on my site to learn and become more confident with investing. If you do want to join the Fool Team and start investing wit Tom and David, you might as well join a commission free trading brokerage. We’ve reviewed the top three “zero commission” trading platforms so you can get started with no hassles. I hope you learned a lot from this review and can take something away from it. If you found something interesting and would like to comment below or have a question you’d like to ask, please do so below. If you know someone who could benefit from this review, please share this with them! Until next time, take care and let’s start investing! I’m very interested in getting involved in the stock market. I’m doing research and acquainting myself with the stock trading logistics, but honestly its just too much. I’d like to find someone that can help me get in touch with some promising stock and teach me the ropes. The main thing is finding someone I can trust. Would this company be able to help me learn as well as help guide me to good stock? Please get back to me as soon as you can. Absolutely! It teaches you why each stock pick is chosen and what makes it a good stock. In addition, the entire site is geared towards educating people on investing of all sorts. It’s a wealth of information. Lastly, they have an amazing community where you can ask questions and get feedback to make sure you learn at your own pace! Thank you for making this product review. I’m glad that there is something out there that actually works and not a scam. My husband is into day trading though and not interested in doing long-term trading, so would the Motley Fool Stock Advisor work for him? If so, I might consider having him take the class. I would not recommend Stock Advisor for Day Trading. I do not currently have a Day Trading course to recommend since I’m not really a day trader. I would recommend looking up Real Life Trading which is a website by Jerremy Newsome. I’ve learned a good deal from him and his content is free! 1. This type of platform requires you to have money to put aside for investing. It’s not a saving account and it needs to be money that you don’t depend on to pay bills and live off of. 2. There are a lot of website scams out there. Motley Fool isn’t one of them. I’ve actually had three services with them in the past. The current one that I reviewed is my favorite. I also have a membership to their Rule Breakers service which is also the name of one of their most popular books. I was also a member of what I think used to be Income Investor which focused on dividend stocks but they closed the doors to this service. All of the services produced me money on my investment well over the money I spent on the service. This might not be the right site for everyone. If you are more interested knowing how to invest without starting with a large sum, You can see my article on How to Invest Change. I’ve had an interest in stock trading since I first came across the concept but dropped it when affiliate marketing gave me strong convictions of success. It’s probably because I didn’t know much about stock trading and the earning potential to investors who have the patience to test it but your review has given me a new orientation about this investment. While Motley Fool Stock Advisor sounds convincing to me that it’s something worth investing, I think it would take some time for me to process it in order to make an informed decision because I can’t risk losing my money. Do you have any material that I can read on stock trading? Thanks for the information. I can appreciate that you want to read up a little bit before taking action with a new investing service. You can read the book that really got me interested in stocks written by David and Tom Gardner – Motley Fool Investment Guide. In addition, you can watch a video that they made on how to invest in stocks. I hope that helps! Nice review. Its always very good to trade stocks with the best experienced in the market. Hence you have confidence in whatever you are doing. There is nothing 100% sure in financial market that is why one has to apply caution and thread softly because you may lose out. But I love this kind of financial advisor that can give you best of financial assistant and help build confidence.